Red Leather Boxing Gloves with White Satin Logo by Everlast | Sports Memorabilia! 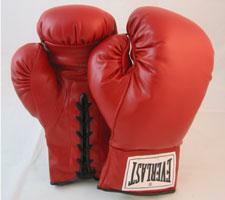 Red Laced Leather Boxing Gloves with White Satin Logo by Everlast. Great for autographs! These are not meant for usage as they do not have the heavy duty padding inside the gloves; designed for autographs.